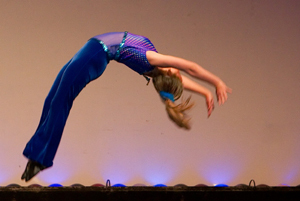 We are pleased to offer a variety of tumbling levels in our curriculum. From cartwheels to flip-flops, you will be exposed to all the basics, then move on to the more difficult tricks. Beginning classes will focus on introducing children with little to no experience to tumbling. Children will begin to learn such skills as forward and backward rolls, backbends from the ground, and building up to the beginnings of a cartwheel. Intermediate classes will build upon skills learned and mastered at the beginning level, with variations to forward and backward rolls, standing backbends, handstands, back walkovers, cartwheels, and round-offs. Advanced level classes will build upon skills learned and mastered at the intermediate level, with back extension rolls, handstand forward rolls, flip flops, aerials, standing back flips, and tumbling sequences such as round-off flip flop. All classes will include flexibility and conditioning training tailored to the level of experience and skill. Copyright © AMA Academy of Performing Arts. All rights reserved.